Kathy's latest books for Maker Media include Fabric and Fiber Inventions, Musical Inventions, and Edible Inventions. She is also the author of Paper Inventions, Making Simple Robots, and other books full of STEAM activities for kids and other beginners. When she's not busy writing, Kathy presents workshops for students and educators at schools, museums, libraries, and makerspaces throughout the Northeast. Visit her at Crafts for Learning. As I mentioned yesterday, the big theme of this year’s Toy Fair in New York is “joining the maker movement.” But to qualify as a genuine maker toy, a plaything should meet some basic criteria. 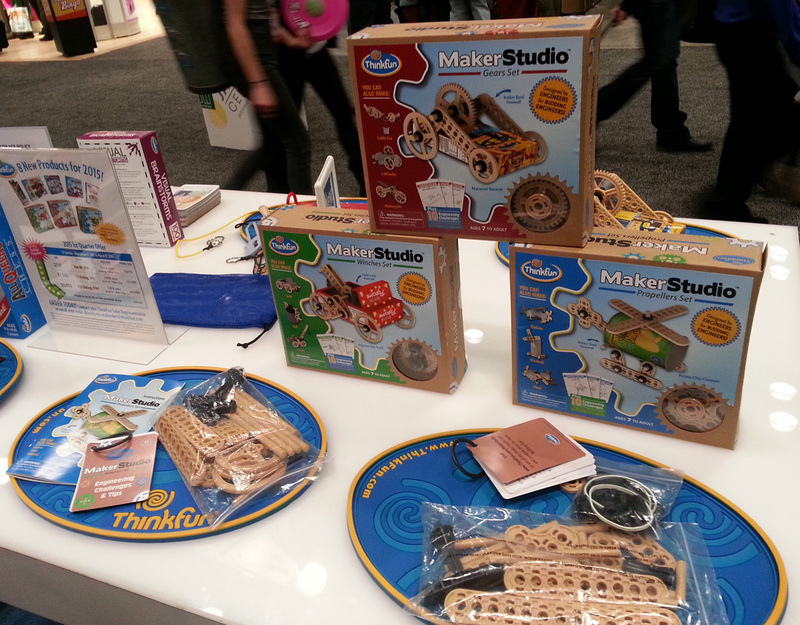 One new series of kits that fits my definition of a maker toy is the Maker Studio Construction Sets from ThinkFun. Each set includes directions for one model, and a booklet of “Engineering Challenges and Tips” with suggestions for improving and expanding on them, such as adding rubber bands to propel the race car. The sets can also be combined to create more complex machines, including a walking robot. Best of all, ThinkFun will be open-sourcing all parts and new expansion pieces, making them available as free downloadable 3D printing files. The kits will be available nationwide in April, and will retail for $19.99, bringing them well within the budget for gifts or starting your own kids’ maker corner.